Last month, Karla Marie Ortiz was riding an All-Terrain Vehicle (ATV) on an unpaved dirt roadway. According to FHP’s report, the 11-year-old attempted to cross lanes when the vehicle traveled over a severely uneven area of the roadway. The child lost control of the 500-pound four-wheel vehicle, which caused the ATV to buckle and overturn. Karla Ortiz was ejected. She was rushed to North Collier Hospital, but was pronounced dead later that day. The 11-year-old was not wearing a helmet at the time of the incident. This new tragedy is sadly all too common. Every year, hundreds of children die in ATV accidents and the legislators have done nothing but stand by the ATV manufacturers’ lobby. In the span of 10 years (2000-2010), there have been 1,394,000 trips to Emergency Rooms to treat for injuries sustained in ATV accidents. There have been 404,800 visits to the ER for injuries sustained by children aged 16 or younger. Of all injuries stemming from an ATV accident, 30% concern children that are 16 or younger. More troubling, 1 out of 5 deaths caused by an ATV accident is of a child aged 16 or younger. 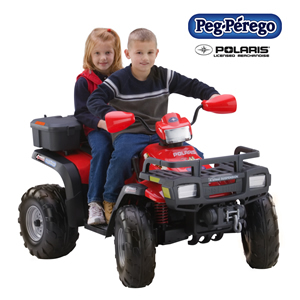 In the large majority of children’s death resulting from the use of an ATV, the child was not wearing a helmet. This latest disaster is no different. Litigation surrounding the use of ATV’s has been ongoing ever since the manufacturing of these vehicles started. In the 1990s, Ira Leesfield engaged in all-terrain vehicle litigation throughout the United States resulting in over $10 million of verdicts and settlements on behalf of seriously injured youngsters, many of whom received ATV’s and other recreational vehicles as holiday gifts. At the time, the main issue was not just the inherent danger of these vehicles, but the fact that parents gave ATV’s to children who were too young, too light, and too inexperienced to handle the power of these vehicles. Early on, ATV’s were marketed by major manufacturers as “toys” with deceptive information in the promotional literature. In the 2000s, while ATV’s are not longer marketed as toys per se, they are still marketed towards parents and children, as depicted on the right. This has resulted in a spike in ATV-related accidents and deaths in the last decade, a large portion of which were of children 16 and younger. Nothing can be done uniformly because ATV’s fall outside of Federal Highway Safety regulations. Each state is in charge of regulating the use of ATV’s on their respective roads. 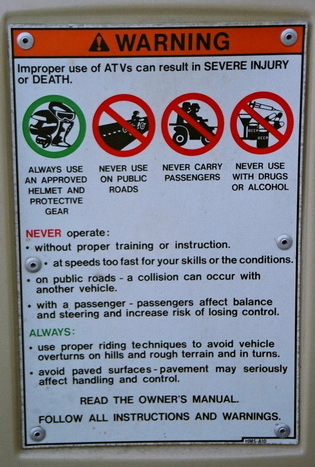 As such, states have set different standards such as the required safety equipment, whether an operator must have a specific license, the number of allowed passengers, and the minimum age of the driver. 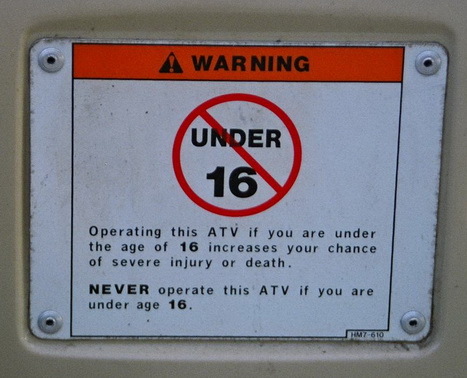 In Florida, the minimum age to ride an ATV unsupervised is 16. Children aged 16 or younger cannot operate an ATV on public lands unless they obtain a safety certificate. Without exception, all riders 16 or younger must wear a helmet and eye protection gear. While the laws in place are sound, they fail to truly address the safety of young riders who operate ATV’s unsupervised on private roads. That is what happened in a prior case handled recently by Leesfield Scolaro, which resulted in a $4.5 million settlement for the death of a 15-year-old girl. At the time, the teenaged girl was spending a weekend on a private ranch with other friends. The owner of the ranch provided the group with an ATV. At one point, the daughter of the ranch’s owner was operating the ATV with her friend sitting behind her as a passenger. The vehicle was traveling at a reasonably fast speed when a cow crossed the private dirt road. The young driver lost control of the vehicle, and both girls were ejected. The 15-year-old passenger was pronounced dead at the scene of the accident. The two teenagers were not wearing a helmet.